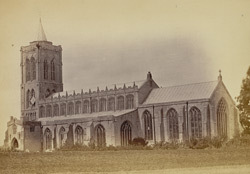 "The Church of S. Mary...consists of a square tower at the west end, about 90 feet high, with a nave 96 feet long, a chancel 48 feet long, and north and south aisles corresponding with the nave in length. The breadth of the Church including these aisles is 65 feet. A handsome south porch of Perpendicular character...forms the principal entrance, and attached to the chancel is a vestry...A portion of the tower, of the 13th century, is the most ancient part of the structure. It is pierced with lancet windows enriched with shafts and dog-tooth mouldings. The upper story was probably added when the body of the Church was re-built sometime during the 15th century. The whole is terminated by a short conical spire." Text by the Vicar of Gedney G Rogers from the book 'The Fen and Marshland Churches'.